This is one of those even better in real life kinds of cards. I had some metallic cardstock given to me by a friend that I put through the Cuttlebug using my new Lace Tree embossing folder. The results were nice but I have a hard time with plain cards so I needed to spruce it up a bit. I took my Versamark embossing pad and VERY LIGHTLY tapped on the top of the embossed area. I then added some of our Silver Embossing Powder and heat embossed the dry embossed areas. I loved the results - very classy and shiny! Love this Paige! Great Idea! I might have to try this. first I guess I better get this embossing folder. Hi Ladies - So glad you liked this technique. 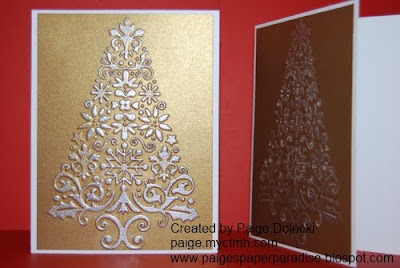 I have another one for you to try - put you paper through a Swiss Dots folder first, then the Lace Tree and then top off with metallic emobssing powder. I've just started playing with double dry embossing and some of the effects are really cool! Oooh, double embossed - too cool - TFS! Gorgeous card! Great technique too, love when I see something new!